Abq Jew ® Blog: Judaic Arts Symposium! Sunday! 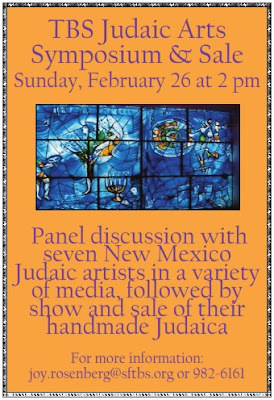 Temple Beth Shalom in Santa Fe: Pardon the interruption, but Abq Jew just got word that Temple Beth Shalom in Santa Fe will be holding its first Judaic Arts Symposium and Sale TOMORROW! Temple Beth Shalom joins a national movement honoring Judaica artists by showcasing metalwork by Jim Cohen, paintings by Diana Bryer, photographs and block prints by Will Karp, ceramics by Karen Milstein and Lia Lynn Rosen, textile art by Beth Surdut, and sculpture by Ivan Barnett. The afternoon will begin with a panel discussion moderated by Ellen Zieselman, Director of Education at the New Mexico Museum of Fine Art. A display and sale of these beautiful, handmade Judaic items will follow. The Judaic Arts Symposium and Sale is free to the public and all are welcome. Info: Contact Joy Rosenberg at joy.rosenberg@sftbs.org or (505) 982-6161. A Taste of Honey! Sunday! Silver Alert Comes to Abq! Good Morning! Time to Polka! Abq Jew Featured in Alltop!